IN THE SPRING of 2005, Steve Belinda and I stood in the middle of the commodious Pinedale Anticline, ninety minutes south of Jackson. We watched a river flow north across the land, wending its way toward the distant heart of Grand Teton National Park. This current, which would take weeks to reach its destination then reverse course again come fall, wasn’t water, but the hooves of pronghorn. Before us, they navigated a scattered maze of energy industry well pads, access roads, and pump stations under construction. (Natural gas drilling was amping up in the area.) From here they encountered gauntlets of barbed wire, a residential subdivision rising on the outskirts of Pinedale, and traffic blazing up and down Highway 89. On that single day I counted three dead antelope—two that had been struck by cars and a third wrapped in a four-string livestock fence. Migrating pronghorn antelope are seen in western Wyoming at a fence crossing. Wildlife biologists have worked with landowners to create more wildlife-friendly fences and road crossings that make it easier for ungulates to navigate. THE GOOD NEWS is that Grand Teton’s pronghorn herd, which spends warm months in Jackson Hole, is still with us. Even more fortuitous is that around the same time Belinda expressed his concern, another ecologist was about to address the problems he flagged. Matthew Kauffman is pioneering an epic monitoring effort, the Wyoming Mi-gration Initiative (WMI), which has attracted attention from around the world. People are following it from rural outposts on Tanzania’s Serengeti Plain, the steppes of Mongolia, and the tundra in the high Alaskan Arctic—some of the only other places in the world that still have terrestrial migrations on the scale of those in the Greater Yellowstone Ecosystem (GYE). 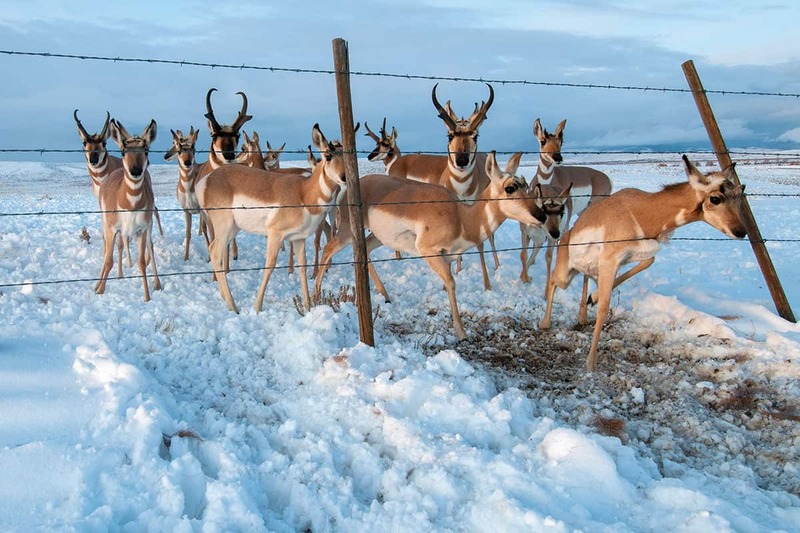 WMI, a collaborative effort housed at the University of Wyoming, is devoted to studying the migrations of the GYE’s major mammal species—pronghorn, mule deer, elk, bighorn sheep, and moose. Migrations like those that the Wyoming Migration Initiative studies set the GYE apart from almost anywhere else in North America. Kauffman grew up in southern Oregon, the son of a horse logger. He spent a lot of time in the woods, and went on to get undergraduate degrees in ecology and biology, and earn a PhD in conservation biology from the University of California at Santa Cruz. Kauffman did post-doc work at the University of Montana in Missoula and then landed at the University of Wyo-ming in 2006. Over the years, Greater Yellowstone has boasted a roster of extraordinary researchers contributing to major scientific advancements. 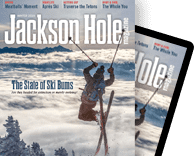 There was Jackson Hole’s own Olaus and Adolph Murie writing on elk, bears, wolves, and coyotes; Frank and John Craighead’s seminal work with grizzlies and radio telemetry; and geophysicist Bob Smith’s insights into supervolcanoes. Plus there’s the Yellowstone Interagency Grizzly Bear Study Team, and groundbreaking studies on GYE trumpeter swans, lobos, fire ecology, and microbes. The work of the Wyoming Migration Initiative is the latest contribution to this incredible resume. And because of it, we now know the 22.5-million-acre tri-state region of Wyoming, Montana, and Idaho contains some of the longest-known pathways for mule deer and pronghorn ever documented. These overland routes rival, in distance, the movement of wildebeest on the Serengeti and caribou herds in the Arctic. At least nine elk herds converge upon the mountain slopes of Yellowstone in summer and then funnel back out again to distant winter ranges. And there’s the pronghorn migration. 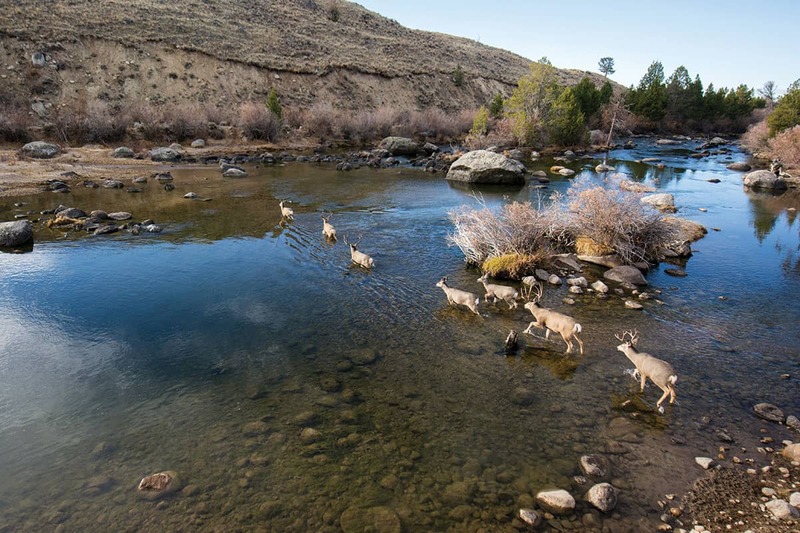 Then, just to the south, a mule deer population 500 animals strong in the Hoback River Basin embarks seasonally on a 300-mile round-trip trek to the Red Desert. AN ARRAY OF metaphors has been invoked to describe the significance of wildlife migrations. Dr. Arthur Middleton, a researcher affiliated with the WMI, draws a comparison to the circulatory system of the human body, a flowing of blood vital to the health of our internal organs and the function of external appendages. At least nine elk herds converge upon the mountain slopes of Yellowstone in summer and then funnel back out again to distant winter ranges. And there’s the pronghorn migration. Then, just to the south, a mule deer population 500 animals strong in the Hoback River Basin embarks seasonally on a 300-mile round-trip trek to the Red Desert. This knowledge has caused ecologists to rethink how the boundaries of Greater Yellowstone are drawn, contributing to a more expansive view of how the region is tied together across man-made lines scrawled on a map. Migrations facilitate the movement of biomass. They transform grass to meat, which, in turn, becomes available to human hunters, wildlife predators such as grizzlies and wolves, and dozens of species of mammalian and avian scavengers. Migrations also reach down to the microbial level in the soil through hoof action by hundreds of thousands of animals and decomposition of ungulates that die in transit, Middleton says. 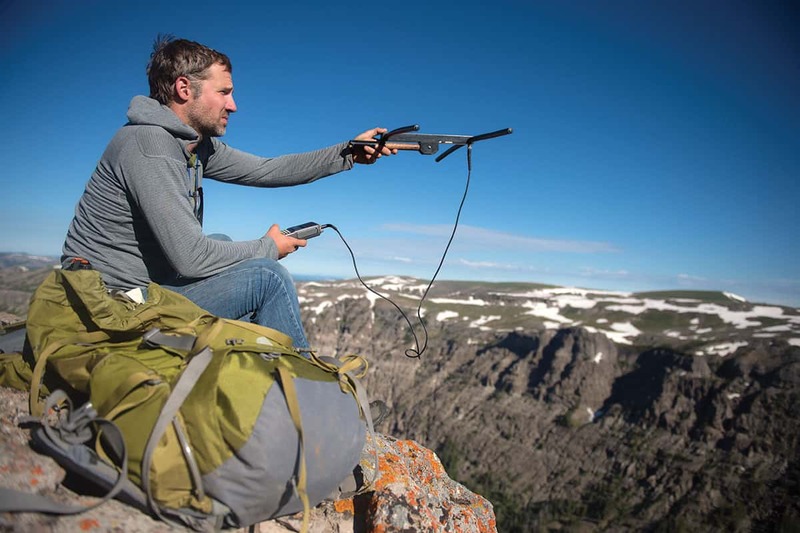 Wildlife ecologist Dr. Arthur Middleton, a professor at UC Berkeley, searches for radio-collared elk in summer range near Yellowstone National Park. HOW WILDLIFE MOVES, and when and where it goes, also affects many other things: the abundance of prey and predators, the potential spread of diseases, hunting opportunities, tourist economies, and decisions regarding the potential location of natural resource extraction, highways, and human development. Elsewhere in the Lower 48, where migration routes became fragmented by human settlement, they often vanished, and, along with them, animal homing instincts that evolved over ages. Migrations do not always adhere to straight routes between points A and B, but involve meanderings attuned to greenup, snowfall, temperature, climate, and other factors that shape highly nuanced timing in travel across landscapes. While Middleton and his colleagues believe migrations rank among Greater Yellowstone’s profoundest wonders, equally jaw-dropping is that the full extent of these wildlife highways was only recently discovered. Elk migrate over a high mountain pass on the eastern boundary of Yellowstone National Park as they head into the park for the summer. This image was made with a motion-triggered camera trap. 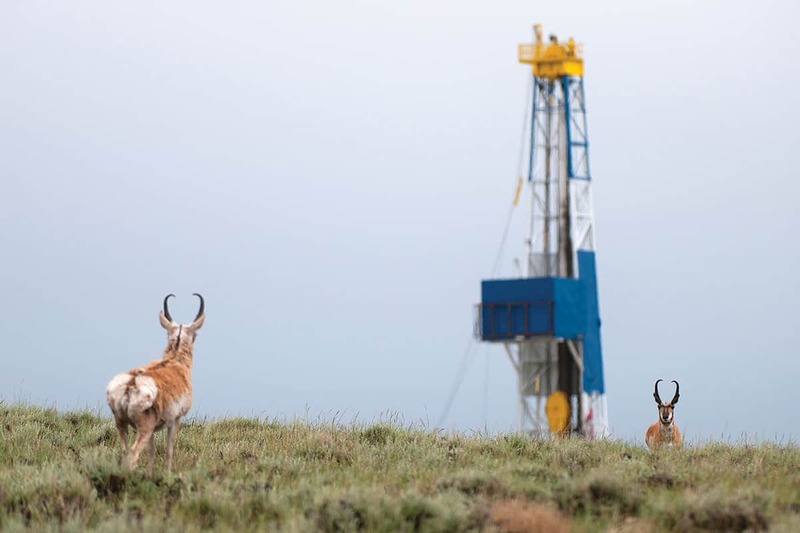 SHORTLY AFTER THE new millennium began, around the time I met with Belinda on the Pinedale Anticline, wildlife biologist Hall Sawyer opened many eyes when he began studying mule deer and the potential impacts of oil and gas drilling in western Wyoming on them. Wyoming Game and Fish biologists knew that some mule deer herds were in steep decline, and that was about it. The typical way science works is that data is collected, published in a peer-reviewed article, circulated narrowly in a journal, and then put on a shelf, seldom to find its way into applied science. Information gathered by the WMI is readily disseminated to government land-management agencies and the public. The organization has an excellent website (migrationinitiative.org) where even schoolchildren have gone to trace the journeys of critters. Under Kauffman’s leadership, the WMI is currently assembling a comprehensive atlas of maps to document where the area’s wildlife routes are. Noteworthy is that for all the public land that migrations cross, the survival of elk, mule deer, and pronghorn herds also depends on how 3 million or 4 million acres of private ranchland are stewarded. As a result of better information unearthed by Sawyer, a key stretch in the mule deer corridor was identified as being vulnerable to development. The late Luke Lynch, former Wyoming State Director of the Conservation Fund—after whom this new wildlife area is named—led the effort to buy this important 364-acre parcel. Nearly half of its $2 million price tag was paid for by the Knobloch Family Foundation in Jackson Hole. Other contributors to the purchase were the Wyoming Game and Fish Department, the Wyoming Wildlife and Natural Resource Trust, and the National Fish and Wildlife Foundation. For Middleton, an “a-ha” moment in understanding the importance of migrations occurred a few years ago when he was investigating declines of calf elk in the Clarks Fork Herd north of Cody. This was immediately blamed on wolves. But by trailing the herd on the full extent of its annual migration, he discovered it was the effects of an extended drought—which impaired the abundance of summer grasses in the mountains—that were impacting elk survival and fecundity. This resulted in fewer healthy offspring. Young elk also were dying from grizzly bear predation. Mule deer cross a creek near Yellowstone National Park. A KEY PORTAL opening the eyes of researchers has been the dazzling imagery of National Geographic photographer and University of Wyoming graduate Joe Riis. 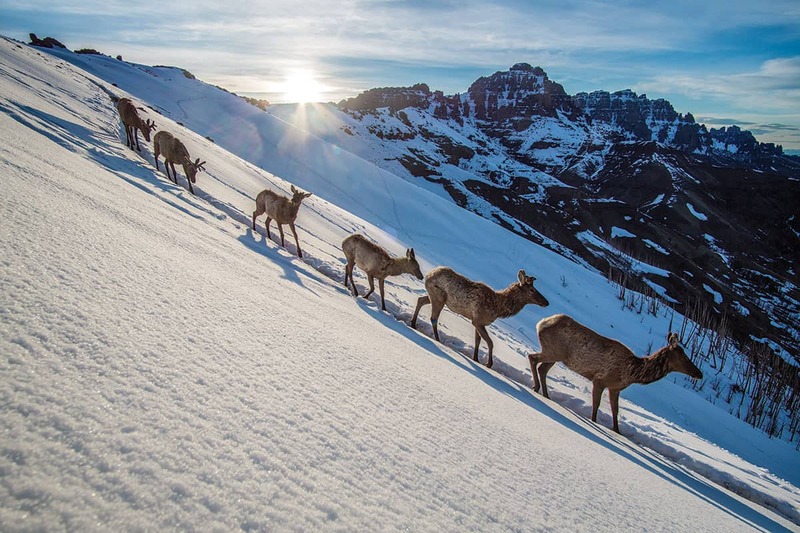 Using camera traps, he has chronicled elk passing through the Thorofore region in the southwest corner of Yellowstone—the most remote roadless area in the Lower 48—climbing steep mountains and fording raging rivers. Riis has also documented antelope wending their way along the “Path of the Pronghorn” through a place called Trapper’s Point, and crossing national forest, Bureau of Land Management tracts, and private land. “Losing wildlife migration is like destroying a human language,” says Joel Berger with the Wildlife Conservation Society. Indeed, migrations reflect more than physical navigation. They serve as windows into the cultures of the animal world, including the learning passed down from mothers to offspring, instincts that have ensured survival from one generation to the next. What will be the effect of climate change? Kauffman says no one knows yet. One thing that hasn’t been a surprise is how animals respond to human-caused disturbance of habitat, because much is known already pertaining to residential development, the impacts of roads, and, more recently, outdoor recreation. “The effect is always the same: Animals don’t like to be near humans, so they alter their behavior in response to human disturbance,” he says. One of the Wyoming Migration Initiative’s newest allies is the Western Landowners Alliance. That group has begun discussions with Greater Yellowstone ranchers who are in a position to make a difference by protecting corridors. Tweaking little things can yield huge dividends in preventing conflicts or eliminating them. What continues to amaze Kauffman is the huge public interest in the phenomenon of migrations. While many wildlife issues are divisive, this one seems less so. The Western Governors’ Association issued a statement expressing its support for studying migrations, joining industry groups, hunters and anglers, recreationists, conservationists, and even local chambers of commerce. There’s no better example of the public interest than the tale of the doe mule deer Jet, a Red Desert-to-Hoback migrant fitted with a satellite collar by a research team. Postings about her over a seven-week period became a sensation on Twitter, also attracting up to 40,000 views on Facebook every time a new map reading was given. Montana and Idaho aren’t aggressively mapping many of their corridors yet, but it’s coming, Kauffman says, noting that he’s been meeting with wildlife officials in those states, sharing with them how the Wyoming Migration Initiative works. They know migration is important, especially for the performance of the big game herds that are treasured. Migrations not only hold the spirit of Greater Yellowstone together, they’re magnets that help tether the nature-loving identity of its human denizens, too.